Along with most kids, I was always ravenous after school. A day of learning and running and socializing left little time for eating and so I was hungry by the time 3:30 rolled around. One day as I was walking home from third grade, I had a brilliant idea for a snack. As soon as I got home, I asked my mom to help me, and she turned on the oven. I lined up Triskets in neat rows on a cookie sheet, put a square of American cheese on each cracker, and put the sheet in the oven. Voila! Melted cheese on crackers! It is still one of my favorite snacks. Lily loves creating her own treats, too. When we ran out of bagels but had cream cheese, she put cream cheese on crackers. She thought they were great; I didn’t care for them much. One weekend morning she invented her specialty which she named “Mexican Cinnamon Buns.” We took a flour tortilla, heated it for 10 seconds in the microwave, and spread a little bit of butter on it. The butter melted deliciously. We sprinkled cinnamon and sugar over the butter and folded the tortilla into quarters. Yum! Emmy is enjoying a Mexican Cinnamon Bun. As my daughters grow older, I enjoy watching them do things that I once did when I was a little girl, such as creating their own snacks. They will probably do a lot of things differently. I only had an oven in the 70’s and today we have a microwave. Technology is constantly changing the way we do things. My husband tells the girls that he only dreamed about video phones, never imagining his daughter would use Skype in her Kindergarten class to virtually meet a pen pal. Yet a bike still has training wheels and a soccer ball still begs to be kicked. And Lily agrees with me…melted crackers on cheese is still a great after-school snack! For more Simple Moments, visit Hyacynth. 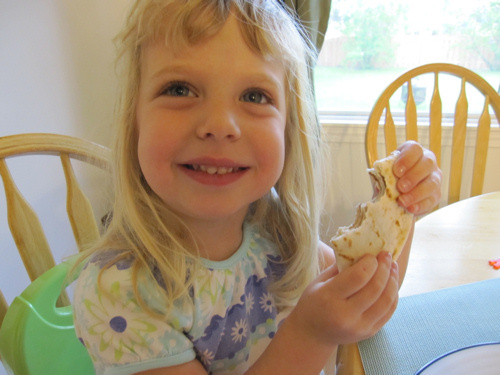 The Mexican cinnamon buns are a great invention too… quick, get that girl a patent!I think it's amazing how different yet alike our kids can be from us based on technology. We've been playing superheros and running around in costume every day like my brothers and I did as kids. Yet my kids will never know what a dial tone sounds like (we don't have a home phone). Weird. What an awesome memory. The cinnamon on the tortilla sounds pretty tasty too! Yes!! My four year old knows how to power up my cell phone and slide the screens to get to the two games I have on it. If I run into a problem with that phone I'm thinking that he might be able to solve it quicker than me! LOL! Times are changing, but I love "Yet a bike still has training wheels and a soccer ball still begs to be kicked." Aww, what a sweet moment! Thank you for sharing! It is hard to imagine what will come next in their world, eh? But yes soccer balls need to be kicked, boo-boos need to be kissed, training wheels have to come off, and we GET to watch them soar! I loved this sweet moment.And now I'm hungry for cheese & crackers. No lie. Her snack idea actually does sound delicious to me! I long for the simplicity of yesterday sometimes. Oh, indeed. The world spins and revolves and morphs around us but those basic tenants of childhood and living and family, well, they remain. Beautiful moment, Ginny! This is just great! My husband and I were both discussing how different the world really is for our kids. My son is downstairs learning a song on the piano, no not the traditional read notes and music, he is doing it through seeing it played on a video on youtube!Your daughter is precious….enjoy! Maybe a little cook on your hands…summer is almost here, so more time to be creative.